USC CAIS Associate Director Dr. Phebe Vayanos, right, introduces our seminar speaker, Dr. Pinar Keskinocak. 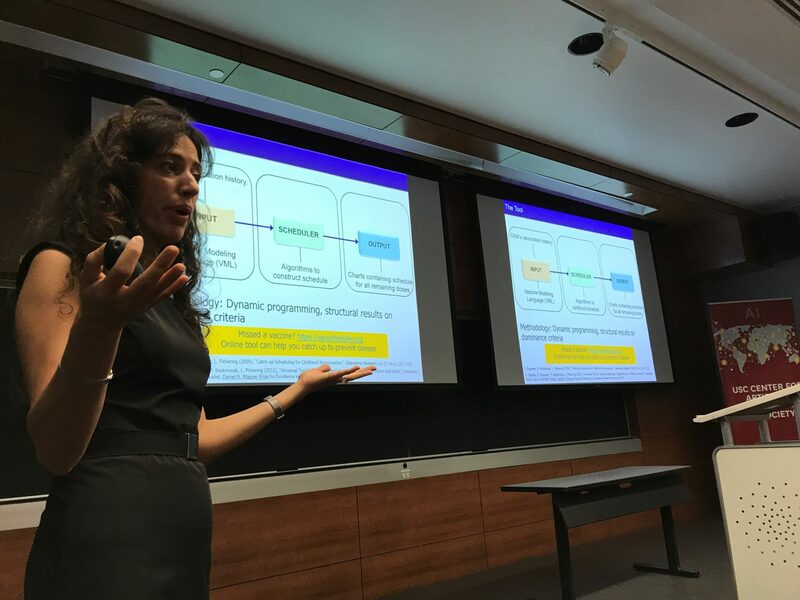 Dr. Pinar Keskinocak, in her talk, gave several examples of how researchers in her group apply techniques from operations research and resource allocation to solve problems pertaining to health and well-being of people. 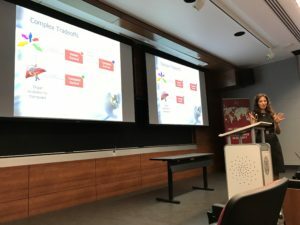 The main research problems that she touched upon in her talk include: developing catch-up schedules for childhood vaccination, combating deaths due to cholera, recommending prenatal screening for down syndrome, and efficiently scheduling organ transplants. An alarming 50% of the children tend to fall behind their recommended vaccination schedule and do not receive timely doses of vaccines. In such a scenario, catching up with the vaccination schedules is not a trivial task. This is because there may be feasibility constraints or other contraindications because the age of the child may no longer warrant the missed dose. So the challenge is to quickly and automatically generate a catch-up schedule, given the history of the received vaccines. The methodology adopted for solving this problem mainly involves utilizing dynamic programming to arrive at structural results on the dominance criteria. They have also implemented the catch-up immunization scheduler and developed a user interface for tracking and scheduling the missed vaccines. Prevention and treatment of cholera is another grim issue facing us, as the disease goes untreated very often and spreads through water, especially in places with poor sanitation. 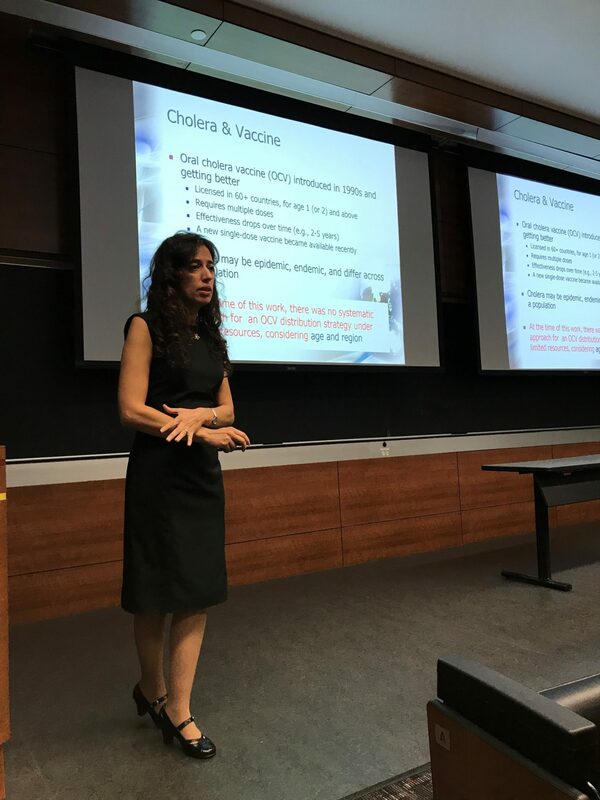 Vaccination is one way to prevent this disease, but the primary issue is the absence of a systematic way of allocating the limited Oral Cholera Vaccines (OCVs). Dr. Keskinocak, through her research handles this issue by designing policies for strategically allocating these sparse resources, with the objective of minimizing cases of cholera and resulting deaths, keeping in mind the constraints such as the capacity, budget, population, age and region. Next, Dr. Keskinocak explained the issue faced while deciding whether or not to conduct a prenatal screening for down syndrome. This is a condition affecting 1 in every 691 babies born. There is a basic, low-risk test, which is not very accurate at detecting the syndrome, but there is also another test, called Amniocentesis, which is more accurate at predicting the condition but also presents a higher risk of losing the baby. Thus, there is a natural trade-off involved, between live undetected down syndrome births, and procedural related fetal loss. 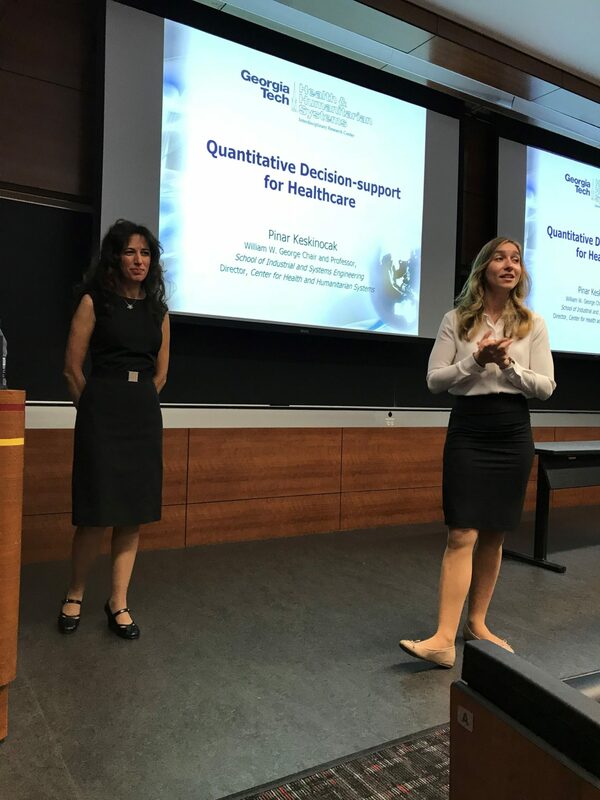 Dr. Keskinocak solves this problem by considering a multitude of factors affecting this decision and by harnessing decision trees to arrive at the optimal recommendation tailor-made for a pregnant woman. This system captures all the relevant parameters through user-friendly, sliding bars and presents the recommendation as its output. Dr. Keskinocak finally elucidated the need for better scheduling and allocation policies for organ transplants, by highlighting the huge gap between the demand and supply of organs. Every 10 minutes, a new patient is added to the list of people waiting for an organ transplant, and a disturbing 21 people die every day, just waiting for a transplant. The main conundrum here, is whether to accept an available organ transplant from a high risk donor, or whether to decline and keep waiting for a new, low-risk organ donor. This decision can be tricky. Dr. Keskinocak utilizes tools such as random forests, to arrive at an age-based survival curve estimate based on the patient and donor characteristics, to determine the best decision regarding an organ transplant.